Is Xcode's debug navigator useless? I am building an app in Xcode and am now deep into the memory management portion of the project. 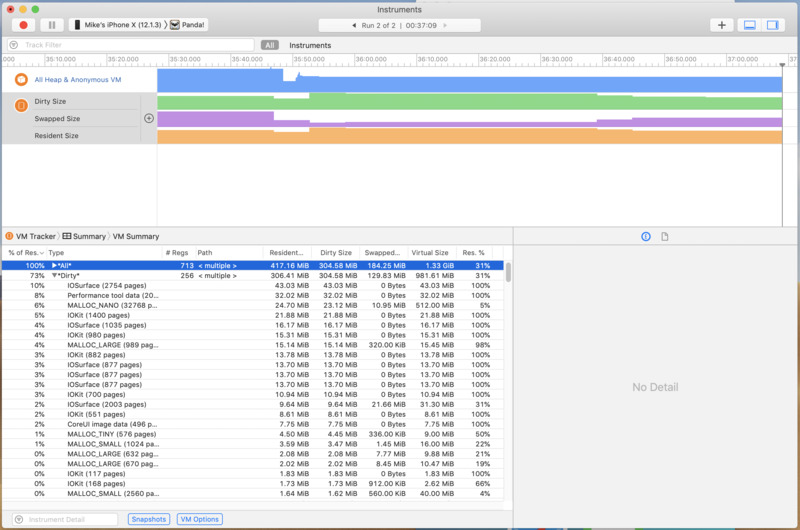 When I use Allocations and Leaks I seem to get entirely different results from what I see in Xcode's debug panel: particularly the debug panel seems to show much higher memory usage than what I see in Allocations and it also seems to highlight leaks that as far as I can tell (1) do not exist and (2) are confirmed to not exist by the Leaks tool. Is this thing useless, or even worse, misleading? Here was a new one: today it told me I was using >1 GB of memory but its little memory meter read significantly <1 GB (and was still wrong if the Allocations data is accurate). Picture below. UPDATE: I ran VM Tracker in a 38-minute session and it does appear virtual memory accounts for the difference between allocations / leaks and the memory gauge. Picture below. I'm not entirely sure how to think about this yet. Our game uses a very large number of textures that are swapped. I imagine this is common in most games of our scale (11 boards, 330 levels; each board and map screen has unique artwork). You are probably using the Memory Gauge while running in the Simulator using a Debug build configuration. Both of those will give you misleading memory results. The only reliable way to know how memory is being managed is to run on a device using a Release build. Instruments uses the Release build configuration, so it's already going to be better than just running and using the Memory Gauge. Moreover, it is a known flaw that the Xcode built-in memory tools, such as the Memory Debugger, can generate false positives for leaks. Yes, but Allocations is not the whole story. You are probably failing to look at the VM allocations. Those are shown separately and often constitute the reason for high memory use (because they include the backing stores for images and the view rendering tree). The Memory Gauge does include virtual memory, so this alone might account for the "difference" you think you're seeing. So, the answer to your question is: No, the Memory Gauge is not useless. It gives a pretty good idea of when you might need to be alert to a memory issue. But you are then expected to switch to Instruments for a proper analysis. Not the answer you're looking for? Browse other questions tagged xcode debugging memory-management memory-leaks allocation or ask your own question. 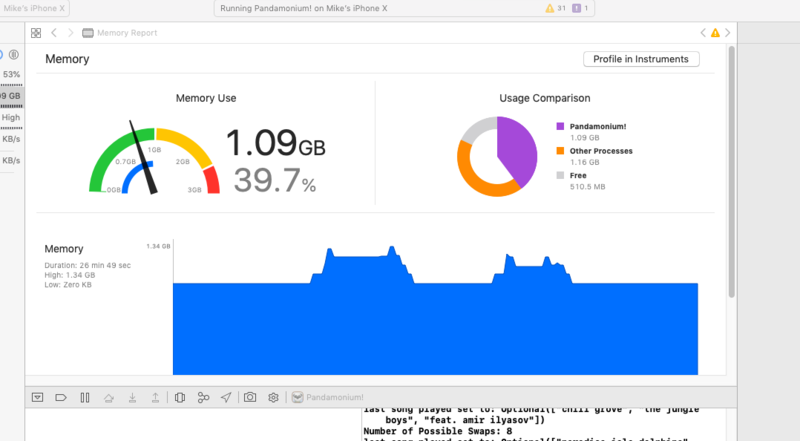 Why would Xcode show MUCH more memory use than Instruments for SceneKit app? Does Xcode's Debug Navigator work different from Instruments allocations?